The thing that struck me as a first time visitor to New Zealand many years ago was the real sense of freedom you got when you arrived on a New Zealand beach. First was the emptiness. I remember hitting a beach on the Coromandel Peninsula, only 100km from Auckland, on a warm afternoon between Christmas and New Years. My friend and I threw out a rug, towels and picnic basket on this beautiful white sandy beach then looked around. It was a mile both ways and I could see one other couple on the beach and they were 500m away. Later they told me it was a busy day and so, they left. New Zealand beaches then are not the place to go if you want to show off a new cossie, or a great suntan or that trim body that you have been working on all winter. Well, there are a few exceptions but it's not like a city beach in Sydney or even the Gold Coast. No, it's not the weather either, it's just that New Zealand doesn't have many people in it. With this then, comes some other great freedoms. People who live near a beach often have their own four-wheel drive RV, be it a 4 x 4 or the more popular four wheel farm bike. These are all about driving on the beach to get to the best fishing spots with all the gear necessary for a fun day out. 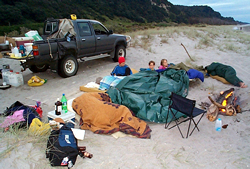 On a New Zealand beach you can drive, camp, have a fire and you will catch fish. I'm a hopeless Aussie fisherman and even I can catch dinner. Like I have never seen elsewhere, the fish here are plentiful and can be got with only a little effort. If surfcasting is your thing then you can find Snapper and Tarakihi, which will range in size up to 4kg off the beach, but more typically about 1kg, better known as a 'pannie', Pan Sized fish. At the river and estuary mouths you can wade in with spinners at the changing tide and cast for Kahawai and these too can vary up to 5kg. Once Kiwis have their catch they have many ways they like to cook them and my favorite for cooking snapper is this. While fishing, get the family to light a fire on the beach. (The kids can be kept amused by hunting for drift-wood to keep the thing going). Once the snapper are caught, you gut the fish and wash in the sea. Stuff the snapper with a thickly sliced lemon and a large daub of butter. Wrap the fish in wetted newspaper, in the sea, until there is about 7 thickness of newspaper over the whole fish. Place the fish in the red-hot coals of the fire until the paper begins to burn. (about 20 minutes). Take it out and eat it. It doesn't get much better.